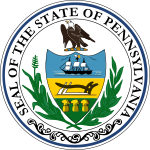 The 1956 United States presidential election in Pennsylvania took place on November 6, 1956. Voters chose 32 representatives, or electors to the Electoral College, who voted for president and vice president. Pennsylvania strongly voted for the Republican nominee, President Dwight D. Eisenhower, over the Democratic nominee, former Illinois Governor Adlai Stevenson. Pennsylvania was the home state of President Eisenhower, as he moved to the Gettysburg area after World War II. Eisenhower won Pennsylvania by a solid 13.19 percentage point margin, and carried every county except Philadelphia and four heavily unionized coal counties in the southwestern "Black Country". ^ David Leip. "1956 Presidential General Election Results – Pennsylvania". Dave Leip's U.S. Election Atlas. Retrieved 2018-03-25. This page was last edited on 28 March 2019, at 03:58 (UTC).